Operating on the larger side of the small Service Lift range, a Trolley Lift works with many of the same advantages as the Microlift, but is capable of lifting up to 300kg. For small and medium sized goods such as trolleys, beer barrels, sack barrows, white goods, or industrial equipment, your goods will be exactly where you want them, when you want them, and with minimal hassle. 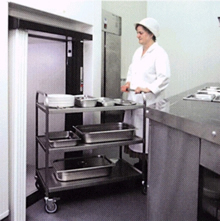 Both the Microlift and the Trolley Lift feature multiple access available on all floors, and a choice between shutter or hinged door styles. Hydrax installs your Service Lift quickly and easily. No need for complex construction, these lifts can be installed in a self-supporting structure, with no requirement for a separate motor room or load-bearing shaft. This results in minimal builders work, and so minimal disruption to your business.